Runners with artificial legs could start setting 100-meter sprint world records in some 50 years’ time, a Japanese researcher has claimed. Given the advances being made in running-specific artificial limbs and sports conditioning, sprinters with prosthetic legs are poised to set records that eclipse those of able-bodied runners around 2068, according to Hiroaki Hobara, a researcher at the National Institute of Advanced Industrial Science and Technology. 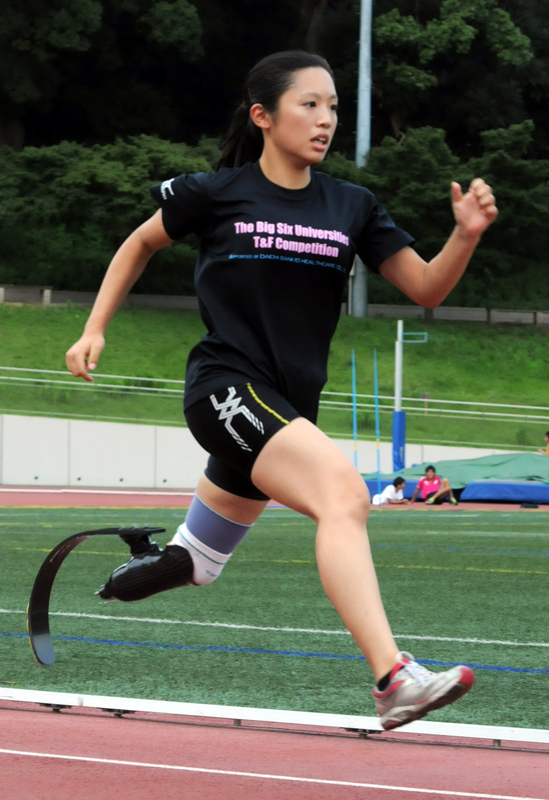 Hobara said there is a high chance that the participation of athletes with artificial legs will become an issue even in the 2020 Tokyo Olympics, and called for holding multifaceted discussions rather than just focusing on whether prostheses provide an unfair edge. He cited the 2.22 second increase in speed over the past 28 years achieved in the men’s 100-meter Paralympic sprint by the winners of that event. The world record in 1984 was 13.12 seconds. That improved to 10.90 seconds in 2012. In contrast, Olympic winners of the same race shortened the time by a smaller margin of 0.36 seconds, from 9.99 in 1984 and 9.63 in 2012. In 2012, South African sprinter Oscar Pistorius became the world’s first amputee to participate in the Olympics after he won a legal battle in 2008 against the International Association of Athletics Federations, which had objected to his participation, saying his artificial limbs gave him an unfair advantage. German long jumper Markus Rehm, also an amputee, set a record of 8.40 meters during the IAAF world championships for athletes with disabilities held last October, beating the previous gold medal-winning record of 8.31 meters set during 2012 London Olympics. He also beat able-bodied rivals in another competition in Britain last month. Rehm wants to compete at the upcoming Summer Olympics in Rio de Janeiro, but the IAAF requires that he prove his prosthesis does not give him an unfair edge over other athletes. In Japan, Paralympian Saki Takakuwa is also a leading track and field athlete and is tipped as a gold medal hopeful in the Rio Games.